Daliform Group will maintain the under mentioned engagement and it expects that will be respected also from the supplier. children / babies can not work in Daliform Group. Children are people who have less than 15 years (14 years if is allow from the local law). In any case will be respected the minimum age for the conclusion of the compulsory education. Daliform Group does not use hard labour, even if it is supplied from prisoners, workers who pay off some debits, or similar situation. people will work in a healthy and safety place, in accordance with the legal requirements in force, provided with a drinking water and sanitation access. Will be warranty the prevention of fire. Will be warranty a suitable ventilation and illumination. Will be warranty the healthy and safety standards also in the accommodation if necessary supplied to his workers. Will be respected the right of assembly, the right to organize and bargain legally and peacefully with the management, without the imposition of penalty or meddling. Will be not applied any discrimination for the recruitment or for the manage of the workers, on the basis of race, religion, age, nationality, social or ethnical origin, sexual trend, political opinions or handicap (in particular about salaries, promotions, disciplinary measure, dismissals and retirement). Will be not use any form of physical punishing, threats or any form of physical, psychological and sexual intimidation against the workers. To the workers will be recognise a sufficient remuneration to cover the essential needs. It is request the completely conformity with the applicable minimum wage and working time; in particular will be respected the rule concerning the warranty minimum wage, overtime, maximum working time, incentive pay and what else will be a part of the salary. Will be provided all the compensation provided for by law. Apart from the exceptional cases, or if is differently regulate by the laws, the company is busy to not exceed the 48 weekly working hours or the 12 daily working hours. If there is not any local law concerning the working time, will be not exceed the 12 hours of overtime. Will be warranty at least 1 day for weekly day off. TPS is busy to repay the overtime of the workers on the bases of the applicable laws, but if there are not rules regarding this argument, the overtime will be repay at the same way as the normal time. TPS ask to its suppliers to inform it about the collaboration with subcontracting for the production of product or components addressed to Daliform Group. The use of subcontracting must be expressly authorised by Daliform Group. The subcontracting must accept the Social Accountability system of Daliform Group. TPS is busy to manifest its conformity with the environmental laws and rules. Daliform Group is busy to respect all the laws and rules applicable to the TPS products, also about the production, labelling and delivery of the product. In the legal rules will be included also the technical standards, national or international, voluntary or compulsory. Daliform Group is busy to verify to the supplier the correct implementation of the above mentioned engagement concerning the social accountability, thought audit to the supplier, that allow the company the admittance if requested. Daliform Group achieved the certification of legality’s rating, that is to say the certification for the virtuous companies, issued by the Antitrust Authority, with a score of two stars and one +. Moreover, it took part in the list of the transparent companies. 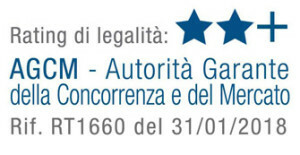 This important result for Daliform Group, shows the attention’s level which characterizes the company, in the correct management of its own business, in full compliance with values of legality, transparence and job’s dignity.